Continuing with my mini paintings of the Florida Landscape this watercolor is of a shore scene with palm trees. 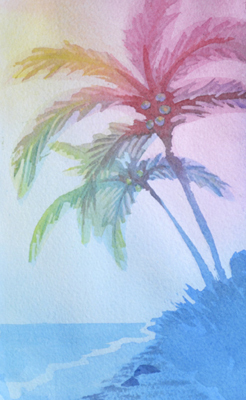 Using three colors I painted a colorful 5″ x 7″ watercolor of palm trees. This Palm Tree Painting is for sale and includes a 8″ x 10″ white mat. I am currently working on a video of painting a 3 color watercolor and I hope to show the painting lesson here on my blog soon. The video will demonstrate the process I use when painting these colorful watercolors. Along with the painting lesson video I will soon have each of these watercolors for sale here on pjcookartist.com. These landscape paintings arrive in a 8 inch by 10 inch acid free white mat inside a clear plastic sleeve. These paintings can easily be framed in a ready made frame purchased at Michael’s Craft Store or AC Moore Crafts.